Avebury was my first ever school trip. I was probably about nine, and although we presumably went to the world’s largest stone circle to talk about Neolithic history, all I can remember about it is making stone rubbings. Of course I didn’t appreciate Avebury then. Growing up in nearby Devizes, it was just there, a slightly annoying obstruction on the main road to Swindon and the main reason bemused tourists occasionally found themselves in our small market town. But I do appreciate Avebury now. Because, my goodness, isn’t it amazing? This Neolithic henge is not just one stone circle, it is three. It covers an area of some 28.5 acres, around which is a continuous man-made ditch some 11 metres deep. There are dozens of stones, placed at regular intervals, and reaching up to more than three metres in height. Reaching out from it are two avenues of standing stones, heading off to other important prehistoric sites – a burial chamber and a mysterious mound. And we still don’t know what it was all for. I arrived mid-morning ready to explore and parked in the large National Trust car park just outside Avebury village. Although this area has been farmed since the Bronze Age, it is now a UNESCO World Heritage Site and heavily protected. You can’t put a shovel in the ground around here without stumbling on more ancient remains and so everything is very low-tech. The car park a gravel patch, the only buildings in the village ancient. At the heart of the village is a 17th century threshing barn, now converted into a museum and the obligatory tearoom, where I meet my mum. “Busy today”, she comments (it is the school holidays), “but there are always people at Avebury.” This has been our catchphrase on too many drives through here to count – even in early mornings when those people have been dog-walking locals, or on winter days when they have been wrapped up from the cold, and late summer nights when the dusky light has highlighted the dark romance of the place. 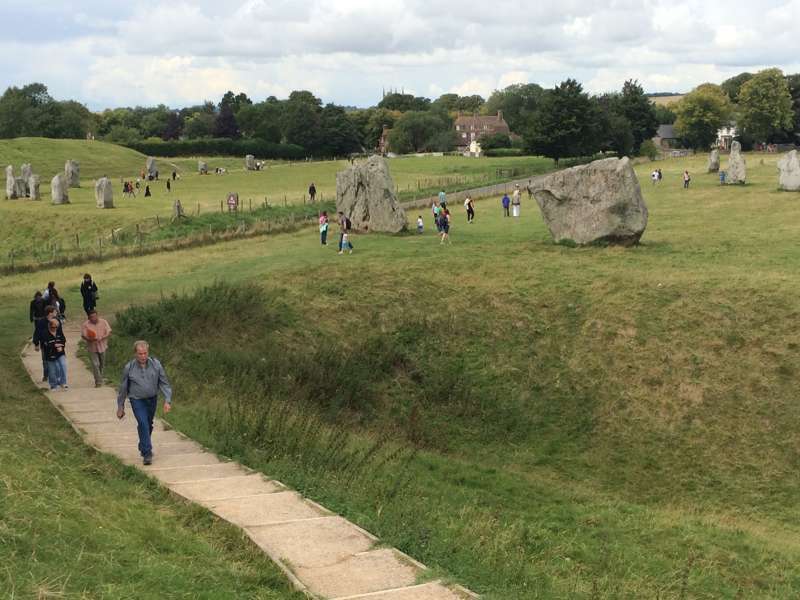 Yes, there are always people at Avebury, but there are never as many as at nearby Stonehenge and never so many you can’t have a stone – even a whole circle of them – to yourself. Although there are numerous groups here today, we have the Devil’s Chair to ourselves, taking turns to sit engulfed by rock in the natural seat in the southern entrance’s largest stone. Later, we enjoy West Kennet Avenue pretty much on our own, on our way out to perhaps my favourite of this area’s Stone Age sites, the West Kennet Long Barrow – just over a mile away through the fields. We romp through the grass, spotting kestrels swooping above the corn – by foot is the best way to reach the barrow (parking is limited) – to what is one of Britain’s largest Neolithic chambered tombs, some 100 metres in length and jaw-droppingly impressive. Built before Stonehenge, in about 3600BC, it was used for over 1,000 years and is estimated to have taken some 15,700 manhours to construct. As with Avebury and Stonehenge, it is baffling to imagine how people could have transported the vast sarsen stones here, then getting them to stand up in position, not just for centuries but for millennia. Not only that. Recent excavations have shown that its side chambers form a perfect isosceles triangle, its height twice the length of its base. Opposite the barrow is Britain’s answer to the pyramids, Silbury Hill – 40 metres tall and constructed entirely from chalk, by best guess in about 2700BC. Because it looks like a pyramid, people once thought it might be hiding treasure and burrowed into it. The BBC even had a crack at it in the 1960s, building a recording studio inside it. But this is all very difficult to imagine now. Today the hill is roped off and visitors must stand to its side, quietly coming up with their own theories of what on earth this could ever have been constructed for. I have no explanation myself. Nor can I explain why there is a crop circle in the cornfield behind us. But I can explain why there are always people at Avebury – because it is quite simply awe-inspiring. Devizes is eight miles from Avebury and the best base for exploring this area. A new boutique hotel, The Peppermill, opens on August 29th and offers six luxurious en suite bedrooms in the town’s oldest building – you can still see the wattle and daub in some places. Downstairs the Peppermill restaurant serves local produce including cracking steaks.